Come experience our warm hospitality, clean, quiet & nonsmoking atmosphere. Enjoy the hills of Flagstaff & explore the Grand Canyon. Feel at home at our 55+ park (min age 25) for a night, a week, or season. Sunday Potlucks. We had a nice 3 night stay here. The showers were nice with hooks and a bench and clean. The gravel in the roads and the sites was deep enough to cover the ground well. There was a nice table and some of the sites have a paved area. The trees are old enough to actualy provide some shade without hitting the rigs. Hwy 89 is right next to the park so sites 1 & 2 can get hwy noise (we were in 2). There are several public patio areas and they had a potluck on Sunday. There are two laundry rooms. Check in was quick and easy and we were escorted to our nice wide site. 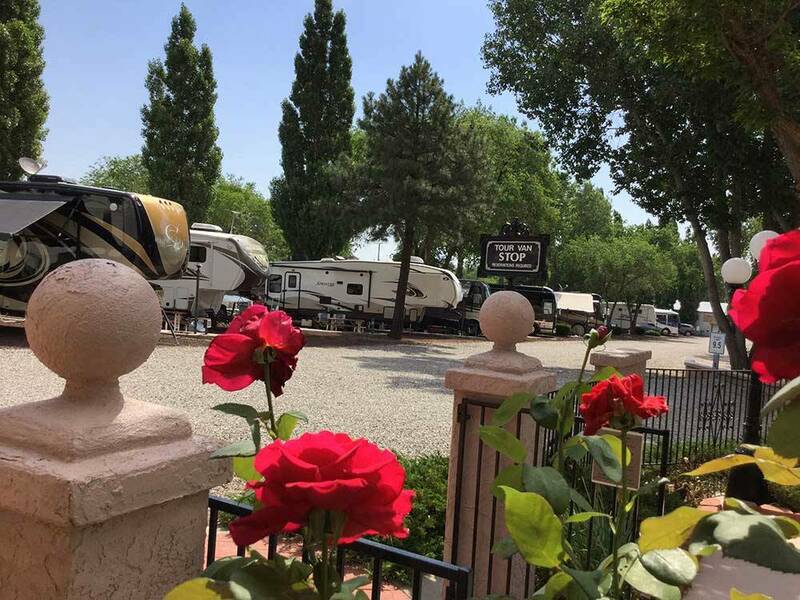 We stayed at the J & H RV Park in Flagstaff in May 2018 for 3 nights. What a beautiful RV park. Very clean, attractive and the owners were so kind, respectful and caring. We would highly recommend this park for any type of RV. Easy hookups. Ours was back in. Top Notch Facility. We made a reservation more that six months in advance for a specific site that would allow us to receive satellite TV. When we checked in we were assigned to a different site even though our requested site was written on the check-in sheet by the owner. Oh, and by the way, you can't climb a ladder in this park, even to clean your windshield, and you can't make any repairs to your rig in this park. Excellent park, lots of tall pine trees, sounds really good with the wind blowing thru the trees, very relaxing after a day of sight seeing. The staff was very helpful getting you into your spot and parked. Park was full every night, be sure you call for reservations. Book early for this treasure! Neat as a pin and the daughter, who works the office could not be any nicer. Spots are large and pull throughs. Best park we found in the Flagstaff area. We slept like logs and did not hear any road noise. Beautiful smaller park on the outskirts of Flagstaff. Staff couldn't be nicer, grounds couldn't be cleaner. Everything you could want except pool or spa. Didn't matter to us, we never use them. Only gripes, highway noise, 24/7. Traffic noise is incessant. In the evening the vehicle exhaust just flowed right through the park . Not what we're use to. None the less, we shall be back. Wow! A really popular site. Be sure to get reservations in early. Easy check in and set up. Helpful staff. Near the highway, but no noise filters through. Great facility with very friendly staff. Pet park was awesome and our miniature golden doodle loved it. Highly recommend this park if you will be staying in Flagstaff. One of the best campgrounds we found in our 7000 mile May/June 2015 travels.